These quality ceramics are dishwasher safe, and no lead compounds are used in the glaze. The bowl is about 3" tall and 6.5" in diameter. This item can be used as a vegetable or salad bowl - or displayed as a knick-knack. The design shown is a nubian head, but all other breeds are available. Your herd name can be added at no extra charge. 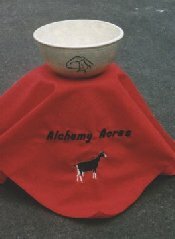 Although we specialize in goat "goodies", many other designs are available - e.g., sheep, cattle, horses, pigs, chickens, dogs, cats. Colors: Tan (shown), Blue, Green, Ask about Others. Pick up your order form here. E-mail us with your questions and suggestions. Back to Alchemy's Home Page.